Calcium is essential for healthy bones and teeth as well as healthy cardiovascular and nervous system function. Although calcium is the most abundant mineral in the human body, we also need other trace minerals for its optimal absorption and retention. 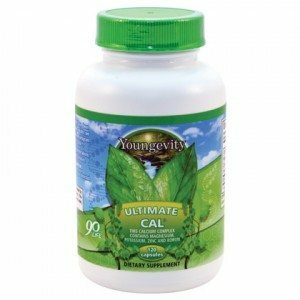 Ultimate™ Cal® provides 460 mg of calcium per serving plus trace minerals essential for good bone health, including phosphorus, magnesium, zinc, potassium, and boron. It’s the ultimate choice for anyone concerned about getting proper amounts of calcium. For best results, use Ultimate™ Cal® as part of a full nutritional program that also includes Majestic Earth® Classic® and Ultimate EFA™. DIRECTIONS: Take 2 capsules twice daily or as directed by your healthcare professional. WARNING: If you are pregnant, nursing or taking medications, seek the advice of your healthcare professional before taking this product. KEEP OUT OF THE REACH OF CHILDREN.